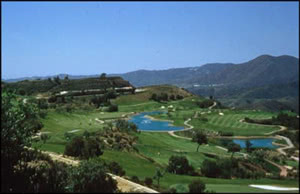 La Canada golf Club was the first public golf course built on the Costa del Sol and locals still get preferential tee times. With the front nine designed by Dave Thomas and the back nine designed by Robert Trent Jones (who also designed the neighbouring courses of Valderrama and real Club de Golf Sotogrande) the expectations of the course are high and do not disappoint. Set on undulating land to the north of Sotogrande Golf Club La Canada is a bit of a hidden gem in the area. The course has been well designed to incorporate natural hazards to offer a variety of interesting and chellenging holes (especially the 18th 'canyon hole' after which the course is named - 'canada'). always well maintained the course is fun and challenging to play and offers some fantastic views of the surround countryside. Visitors are welcome, contact club to make arrangements.